Las Vegas, United States－January 9th, 2019－Thermaltake, the leading PC DIY premium brand for Cooling , Gaming Gear and Enthusiast Memory solutions, has expanded the Toughpower iRGB PLUS family with the Toughpower iRGB PLUS Gold Series- TT Premium Edition, which includes 3 models: 1000W, 850W and 750W. The Gold-certified members are the first ever in the world to pack the patented ultra-silent, 16.8 million-color Riing Duo 14 RGB fan with 18 addressable LEDs preinstalled (12 on the fan frame and 6 around the hub), providing vivid 14 lighting mode options. The series is supported by Thermaltake’s technologically advanced PSU/PC management platform, Smart Power Management, so users get to control the lighting and digitally manage their asset anytime, anywhere while staying green. The Toughpower iRGB PLUS Gold Series is also a new addition to the TT RGB PLUS Ecosystem, where users can control illumination and experience synchronized RGB lighting effects on their TT RGB PLUS system through a few clicks or AI Voice Control. Thermaltake has even taken lighting synchronization to the next level teaming up with Amazon Alexa and Razer Chroma. Outside of RGB illumination, the fully modular members feature 100% premium Japanese capacitors, Smart Zero Fan, excellent <30mVripple suppression and steady voltage output for amazing reliability and very silent operation. Backed up by a hefty 10-year warranty, the Toughpower iRGB PLUS Gold Series permits a captivating way to make users’ systems match their intended color scheme and gives best-in-class, mute operation for all kinds of chassis. Smart Power Management (SPM) is a cloud-based software that seamlessly integrates three intelligent platforms – DPS G PC APP, DPS G Smart Power Management Cloud and DPS G Mobile APP– and compiles key statistics about your PC into detailed charts and breakdowns for your instant PC status view and management. With easy access to SPM through your PC or mobile devices, whether you are outside or indoors, enjoy taking full control of your build anytime, anywhere! What is TT RGB PLUS Ecosystem? system collect historical data in easy-to-read charts for your review. historical data, our Mobile APP and Cloud system have them all covered! can even verbally command lighting modes via AI Voice Control on Mobile APP. lower noises; “Performance” speeds up the fan to optimize thermal performance; “Zero Fan” starts up the fan on a specific percent of loading so as to minimize PC audible noises. normal level) occurs. Then users can shut down their PC remotely to avoid further damage. message or when they schedule PC to shutdown at any time they want, all through their PC/mobile device. Through DPS G PC APP and Mobile APP, the 16.8 million color Riing Duo 14 RGB fan can be switched among 14 lighting modes (Full lighted, Flow, RGB Spectrum, Ripple, Blink, Pulse, Wave, Cross, Firefly, Heartbeat, Stack, Roundabout, Swirl and Thermal) and an LED off. Each lighting mode features four light speed options (Extreme, Fast, Normal, Slow). The apps also allows users to customize the RGB lighting remotely for their power supply fan, and even let the LED dance in sync with the beat. Making your systems match the color scheme you want has never been so easy! 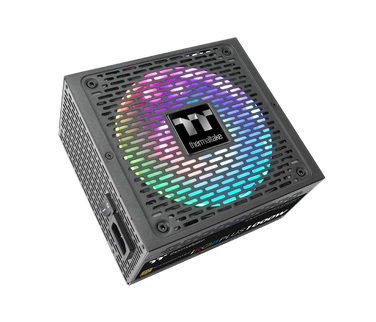 The Toughpower iRGB PLUS Gold Series features patented ultra-silent, 16.8 million-color Riing Duo 14 RGB fan with 18 addressable LEDs preinstalled (12 on the fan frame and 6 around the hub) to provide vivid 14 lighting mode options. Users can freely adjust fan speed and customize the lighting effects with Thermaltake DPS G PC and Mobile App/TT RGB PLUS Software. 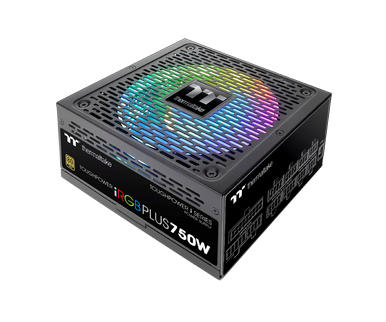 Featuring 18 addressable single LEDs, great light coverage, uniform color and brightness, users are allowed to easily configure the RGB lighting and freely adjust fan speed with Thermaltake DPS G PC and Mobile App/TT RGB PLUS Software. All ripples are lower than 30mV for high stability on +12V, +5V, or +3.3V from 0% to 100% load to ensure a high quality power supply. Our voltage regulation of the PSU is more strict than Intel’s. It is set to no more than ±2% for major rails to meet the highest performance. Features 100% high quality Japanese brand capacitors to greatly improve the durability and offer the highest stability and reliability. Toughpower iRGB PLUS Gold Series comes with a 32Bit Microcontroller Unit (MCU) from Microchip Technology. The 32Bit MCU is a small computer on a single integrated circuit containing a processor core, memory, and programmable input/output peripherals. MCU can digitally control devices and processes, such as automobile engine control systems and office machines. Toughpower iRGB PLUS Gold Series Power Supply delivers up to 90% efficiency under real-world load conditions, promising the lowest power losses. Additionally, this series has been optimized to work with all generations of Intel’s processors to achieve maximum energy saving. The new Toughpower iRGB PLUS Gold Series PSUs will be available in January 2019, via the Thermaltake worldwide network of authorized retailers and distributors. Toughpower iRGB PLUS Gold Series power supplies are backed by a ten-year warranty and supported by the Thermaltake worldwide customer service and technical support network. 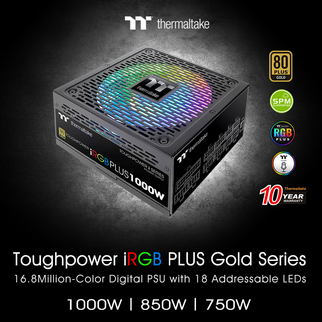 For up-to-date pricing of the new Toughpower iRGB PLUS Gold Series power supply, please refer to the Thermaltake website or contact your local Thermaltake sales or PR representative.